If you watch some of Ma Long's matches like 5-6 years back, he used to use the reverse serve a lot. But nowadays he never pulls it out. He uses backhand as an emergency option sometimes, but not the reverse. What happened? He used it a couple of times against Liang Jingkun in the China Open. The novelty wore off. Or, a bit less crudely, to me table tennis at that level seems to be an advanced arms race in which all participants seek to gain an edge by pushing technique, body physics and athletics just a bit further, and by finding new tactics, new strategies. As opponents adapt, the gained value diminishes. I think that holds true for serves in particular. Haromoto worked hard on deepening his service arsenal, and it paid off. I fully expect his opponents to learn from this, adapt, and close up or even leap over that little gap. While this is true and I completely agree, it does not explain why his reverse pendulum in particular got left behind in the 'arms race'. I think the reverse serve does not set him up for the third ball as well as he would like to. It must be a tactical thing, for someone at the world class level and especially for someone from the CNT I really doubt that there is such a thing as 'Serve A (standard pendulum) is better than Serve B (reverse), hence I won't use Serve B anymore'. They have enough time to practise and I'm pretty sure his reverse is ridiculously good just like all other serves. I'll give you a personal example: Let's assume I have to choose between serving short pendulum with side-backspin or short reverse with side-backspin. If someone is convinced that returning everything to my backhand is the key to victory, I rarely ever serve a reverse, because the reverse sidespin makes it harder to pivot for me personally. Contrary to that, my deception and spin variation on the standard pendulum is not the greatest and definitely far away from Ma Long's, so it makes sense for me to toss in a reverse just to keep the opponent guessing. Serves on our level have a much higher potential to be a direct point, whereas on the pro level you always serve with the intent of setting up your first attack (or nowadays, your first counter). Of course, they have more time to polish their serves, but their margin of error is a lot less. If at my level the serve goes half-long instead of short, or bounces an inch higher, I may still survive. Or even get a comfortable return. While at theirs it is game over. Ma Long uses his "normal" pendulum serve more than his reverse pendulum serve because his forehand attack is stronger and he feels more confident with his FH. After the serve he want to get primary in play with his FH. Now a days he's more forehand oriented (not over the table) like Timo Boll. The last matches he uses his backhand more to block the ball and not so often to attack. Yes your right. Maybe he was a bit tired after the China Open or surprised of Harimotos playing style. 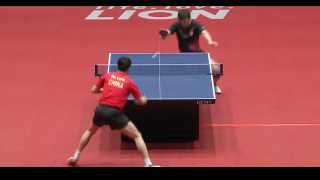 We've seen that Ma Long is still the best at the China Open against Fan Zhendong. If ZJK almost beat HT (deuce game 7) don't you guys think ML have a much better chance? Of course he will come back and teach HT a TT lesson in next match. I still do not think HT has enough weapon to beat FZD or ML consistently, yet! He got lucky this time in his home town. Last edited by tropical; 06-12-2018 at 05:33 PM. If anything, ZJK also has cut down on the reverse pendulum serve since his return at the Hong Kong Open. FZD: More than Rivals with ML - A Common Goal and Duty! TH don't get lucky, he played tactically very good against ML and ZJK. Maybe you've seen that he blocked the topspin every time in a different pace, that's it. Change the pace is a very effective way to win against Top players. ZJK has improved his forehand and it was more consistent than the BH. He over hit the BH TS more often than the forehand, that's the reason why he used more pendulum serve. I would think it is too early to say as this is just another tournament when ML lost in his long career. In this tournament there is no doubt HT beat him as ML seemed to be sluggish and didn't show his fighting spirit as usual. HT showed no fear as any 14 yo kid genius could in his match against ML and especially ZJK. ML lost to many non-Chinese players before and he always comes back and beats them soundly. That was what I meant by HT got lucky this time just like other non-Chinese ever beat him before. Look at this record from ML. HT should be able to beat him next time or more to establish his genuis status. But don't get me wrong, I really think HT seems to be the next world champion based on his age and skill that we have seen so far and CNT doesn't look like they have a good solution yet how to deal with him in the next 10 years. I think HT is a very good and smart player but the CNT also has shown that they are the best in the important Tournaments like the world championchips or Olympic Games. ML seemed to be sluggish you're right, I think so too. 05 FX or Rasanter V42.